Michele Rosenthal’s art is perfect for an adventure story about Kraftwerk: It’s hard-edged, linear, simplified to the point of being iconic. She uses black, white, and a single gray tone, adding to the mechanical feel. Some of the objects in the comic, such as keyboards, could be clip art. Yet each of the four members of Kraftwerk has a slightly different face, and although they are expressionless, identically dressed, and talk like sci-fi robots, slightly different personalities emerge. In this short comic, written by Mike Rosenthal, the band is in the middle of a performance when a drop of Florian’s sweat falls onto his keyboard, giving it life. The band’s four keyboards then unite and create a kind of musical golem, attempting to take over the world. 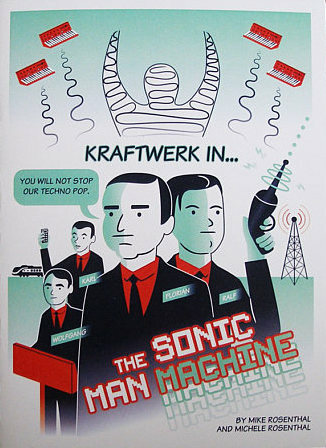 Of course, in the end, Kraftwerk triumphs, but it’s a strange and weird adventure along the way. I also greatly enjoyed Michele Rosenthal’s tiny comic Adventures in Faceblindness, which is a bit of a shaggy dog story about a woman who meets a man she doesn’t recognize and marries him anyway, learning the truth on their wedding day. This is one of my favorite types of minicomics, a short account of some quirky bit of life or history. Although it sounds like it might have been part of the Underground Railroad, the Freedom Tunnel is in fact a real railroad tunnel that was covered over by Robert Moses in the 1930s. By the 1970s, trains were no longer using the tunnel—but people were. A group of New York teenagers, led by Chris Pape (whose nickname was Freedom) started doing graffiti in the tunnel and later on Pape returned and began doing spray paint murals in an unusual silver-and-black style. Eventually he met and became friendly with the people who were living in the tunnel, as well as other outsider artists working there. The whole thing blew up in the 1990s, after the book The Mole People brought this subterranean society to public attention, and Amtrak (which now owned the tunnel) eventually sealed it up and painted over the murals. This beautifully produced book, with black and white art and a striking black-and-gold cover, is a new edition of a minicomic Holden first published in 1995, and it brings the story up to date. The setting of Travelogue will be familiar to anyone who reads fantasy comics, although it feels like we have dropped in in the middle of the story. It’s really just a slice of life tale about travelers in a fairly hospitable land. The narrator, Nana, is small and childlike but is actually an adult who is very perceptive and able to talk to animals and stones. Nana’s companions, Adi and Emerene, are dark-skinned and dark-haired and seem more adult, although Nana appears to be more powerful. Together they journey through woods and plains, watch the sun rise, and just generally exist. The incidents are fairly small: Nana finds a dead branch with still-living flowers; Nana and Emerene discuss Emerene’s ability to start fires; Nana moves some fallen rocks to make a pasture safer for the grazing goats. There is no big drama, no dragon-slaying, but rather a quiet story that builds up an entire world, piece by piece. Pandya draws her story in a style similar to the post-manga fantasy style that has become fairly common now: The characters are simply drawn, with large eyes and rounded noses. Her skill comes through on every page, though, in both the characters and the backgrounds, and her palette relies heavily on muted tones, bursting into brighter colors on occasion. 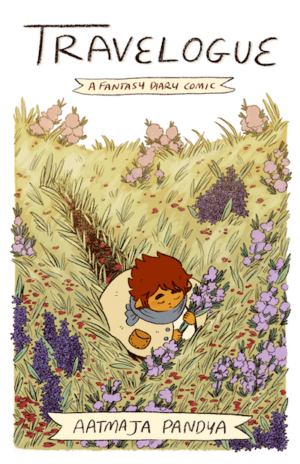 The comic is online, and copies of the minicomic are theoretically available at Pandya’s site, although it’s sold out at the moment.